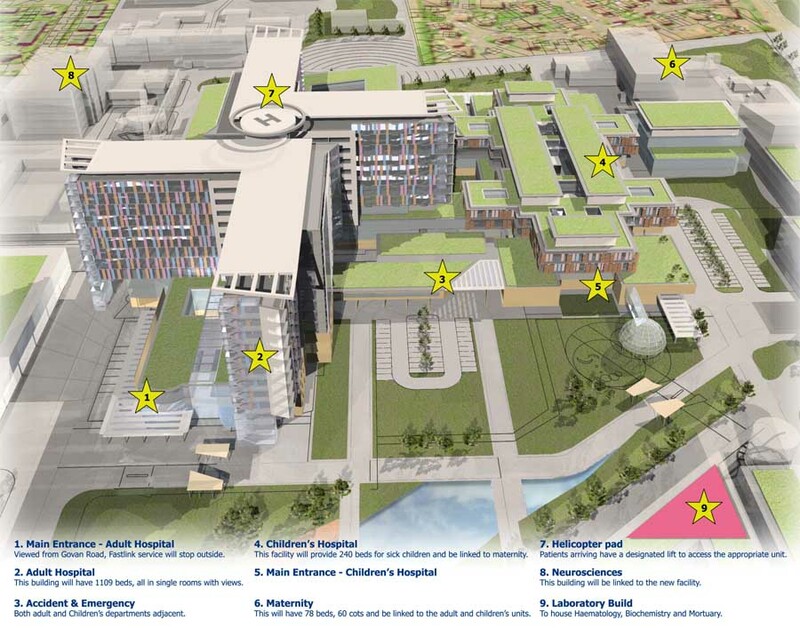 The 700 space car park is the first of 4 multi storey units proposed to serve the New South Glasgow Hospitals campus, which is currently under construction. The car park is the first new building to be erected along the new spine road, and is a significant element within the new hospital development. 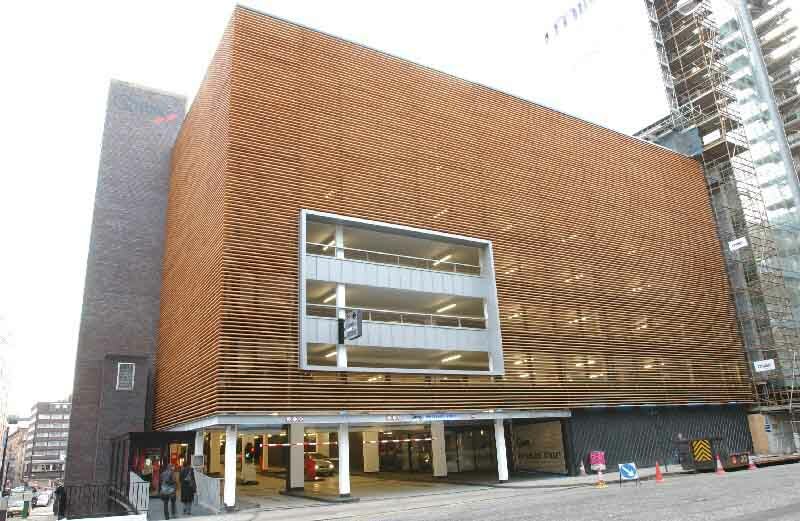 In its basic form the proposed car park building is rectangular, with the footprint fully occupying the available site. 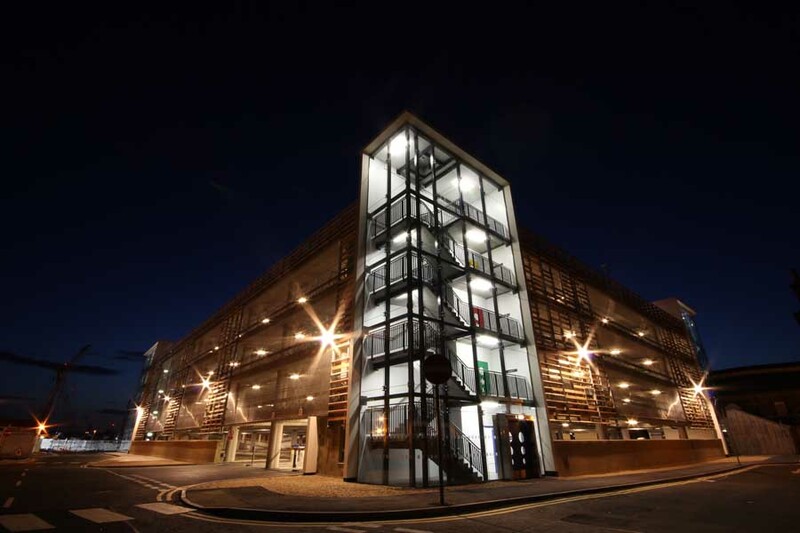 The two access ramps are located at the west end of the building and their helical forms break out of the rectilinear structure, creating an ‘event’ in the streetscape. 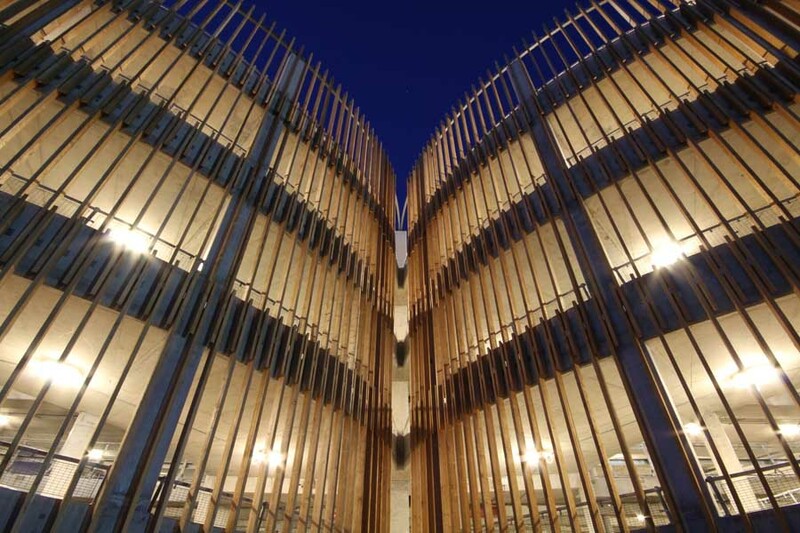 Enclosed in the soft cladding veil of vertical ‘natural larch slats’, the twin ramps act as an identifiable and reassuring navigation marker to visitors, patients and staff. The stairs are major features in the design, with their simple form and transparency contrasting with the fretted detail and texture of the louver and mesh panelled facades. 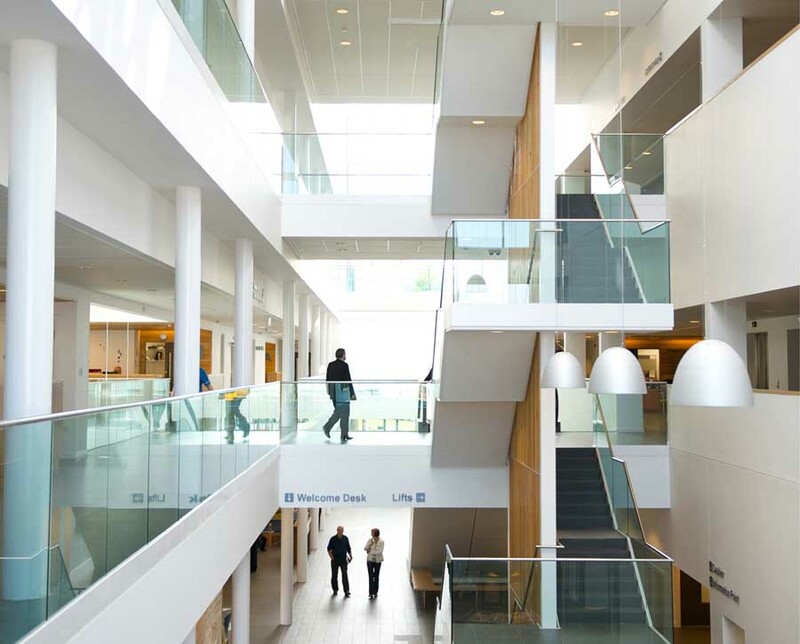 Frameless ‘structural’ glazing is used to the outer walls of the stair towers allowing daylight to flood in and clear views out, contrasting with the filtered light quality of the parking decks, enclosed in lightly timbered screens. The solid walls and roof elements of the stairs are finished in smooth white render, enhancing the simple, clean lines. The stair towers are designed to act as light beacons at night. Sandstone walls protect the ground floor levels on all elevations, and act as a ‘plinth’ to the building composition. This use of natural sandstone responds to the adjacent retained listed buildings and provides an aesthetically pleasing but robust surface at the point of contact with the external skin. 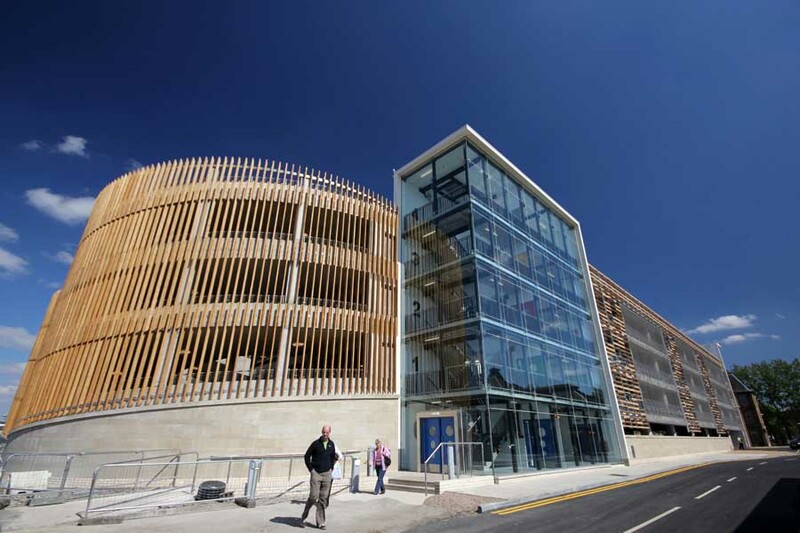 The building utilises natural timber cladding as a way of ‘humanizing’ the car park experience for patients, visitors, and staff. 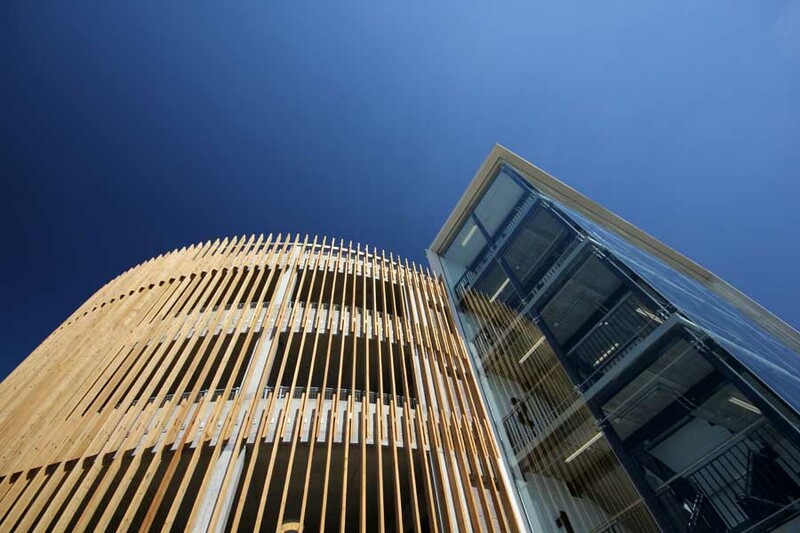 Fire treated Siberian larch louvers are used in both vertical and horizontal formats. Vertical timbers are arranged around the curvature of both ramps and are unfinished ‘off the saw’. 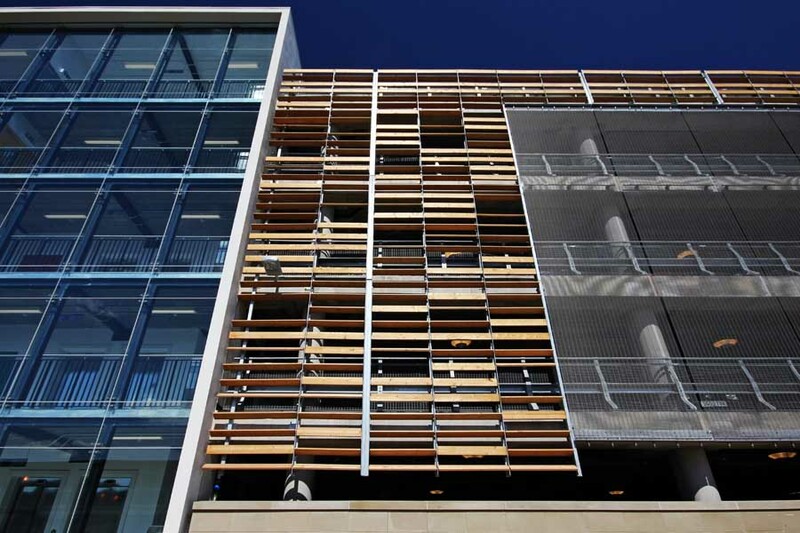 In contrast, smooth finished, horizontal timber blades are inserted on the other 3 elevations in a galvanised steel carrier system and are staggered and rotated to create a dynamic ‘fluttering’ effect in the sunlight. 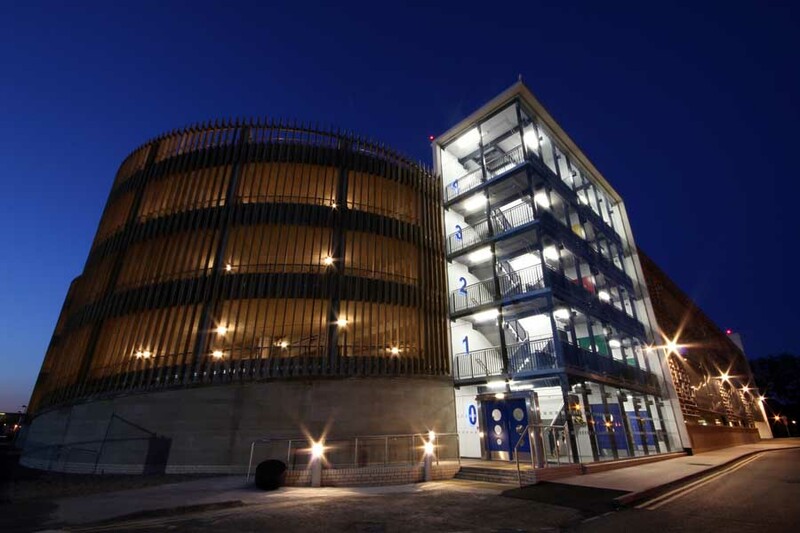 Multi-Storey Car Park, Glasgow + Advanced Forming Research Centre at Strathclyde University – both designed by Hypostyle Architects, Glasgow, are the only built projects in Scotland to be nominated in the annual WAF Awards – World Architecture Festival Awards.